Successfully Added Auto Detective Pen to your Shopping Cart. Detective pen for easily finding audio bugs and mobile's broadcasting within a 1 to 10 meter vicinity. This products unique design makes the pen flash faster and faster the closer you are to the transmitting bug or mobile. With a professional RF detective design, this covert detecting pen will give you 24 hours a day privacy protection from audio transmitting bugs, wherever you happen to be. 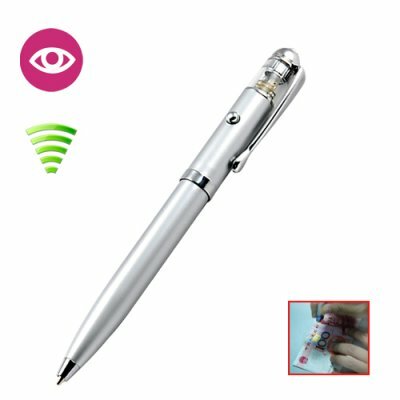 Very portable, this pen not only will detect transmitting signals from audio bugs and mobiles, but is actually a working pen you can write with and has a handy UV light for checking money as well! A interesting gadget to be sure, this featured anti-bugging device is fun, useful, and available for a super low wholesale price. Very good item, works as they say that it will work. on 2010-07-27 22:51:29 I should buy this. I would love to but this pen, but I am already buying too many other spy products. I just hope this item will still be here when I am able to buy it!! I could seriously use this one. very happy first item bought off chinavision as a test to see if item would arrive and yes it did 3 days from china tracking number given very easy to do business with i will be doing a lot more with them.As for the pen It is awesome first test was to use a mobile to see if it can detect a common signal did its job fine.